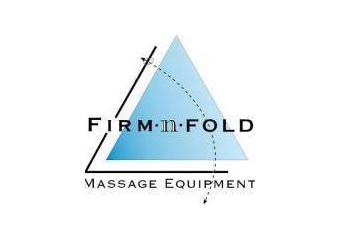 Firm.n.Fold have been Australia's principal provider of massage equipment for over 30 years. We're passionate about the natural therapies industry and proud supporters of it's training providers, members and associations. 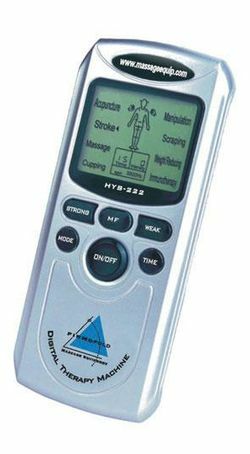 With over 300 products available to view and order online, we are your one-stop massage supply shop with outlets in Brisbane, Melbourne, Sydney and the Gold Coast and a number of distributors around Australia and overseas. 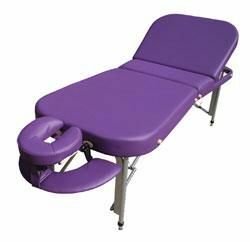 The most padded, comfortable, stationary massage table, ideal in a spa environment. The solid timber legs, available in two finishes to match your décor, make for a very stable, sturdy and good looking table. Includes adjustable face crest extension, lower armrest and handy storage shelf. 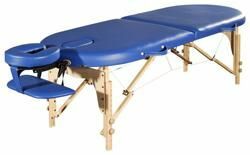 The innovative leg adjustment system on this multi-functional timber table allows it to be set at a tilt, ideal for lymphatic drainage treatments, or set level for massage therapies, or with the back lifted for beauty treatments. Includes an adjustable face crest and arm rest. The Essence stationary table series offers a good sturdy design plus the convenience of height adjustment and an open storage shelf. Available in Navy colour only. The Kaiser series of stationary tables are ideally suited to the spa environment with their good looks and handy integrated storage cabinet. PLEASE NOTE: This is a special order item so please allow 12 weeks for delivery. The Firm.n.Fold range of powerlift tables has something for everyone, to suit a range of modalities and a range of budgets. Rectangular 1, 2 and 3 piece treatment tables, contoured tables, spa couches, all backed by our Firm.n.Fold warranty and excellent service. 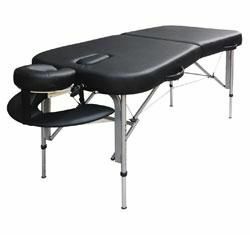 The Healers Choice portable massage table is a solid timber framed table. 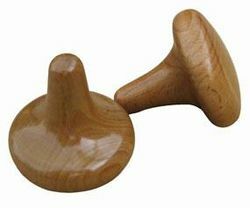 The face recess can be filled in with the face recess plug that is included in the table price. This complete package also includes an adjustable face crest, arm rest and carry bag. 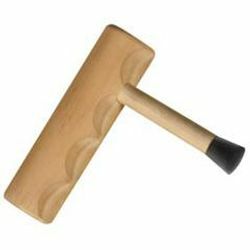 The face crest provides extra comfort for your clients, extra length to the table and better access to the neck area for the therapist. Reiki, and other therapists using energy, will appreciate the beautifully crafted hard wood frame which allows a free flow of energy. 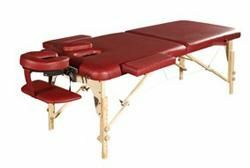 The added advantage of Reiki end panels means better access at each end of the table. 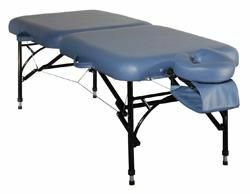 The lightest aluminium table in our range at just 11kg, this aluminium framed portable massage table is an excellent choice for students and the budget conscious mobile therapist. Includes free face crest, arm sling and carry bag! 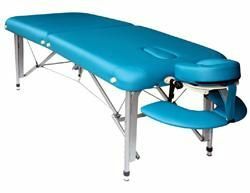 The Zuma Contour portable massage table brings a lovely flow to your work with it’s wonderfully rounded, hourglass shaping through the mid section. The egonomic design provides better access to the lower lumber region. That, coupled with the rounded sewn corners and new soft touch upholstery, makes the Zuma Ultra Contour a delight to work on. The aluminium D leg design ensures hassle free height adjustment and vaulted end panels allow therapist leg room at both ends of the table and evenly distribute pressure through the frame, ensuring a strong and stable table. Includes face crest, armrest, face recess plug and carry bag. 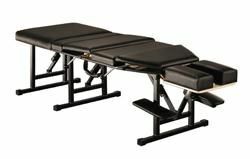 This super low and wide table is ideal for Thai massage. It features a sturdy European Beechwood frame with a rich walnut finish, and includes a face crest, armrest and carry bag. 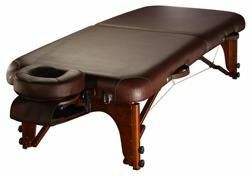 Designed for ayurvedic medicine, this table is equipped with a raised surrounding rim for oil-intensive massages and effusions. 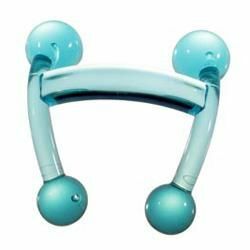 The headrest has been specially developed for forehead oil effusions. 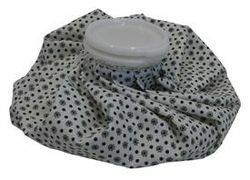 Includes oil proof vinyl cover to prolong the life of your table. PLEASE NOTE: This is a special order item so please allow up to 12 weeks for delivery. 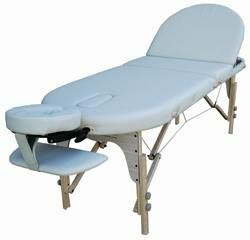 At under 5kg this light, compact, massage unit ideal for corporate massage. 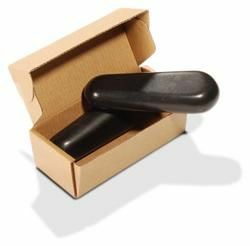 Highly portable and quick to set up, it can used on any desk or table top for quick neck and shoulder massages. The headrest and chest supports are adjustable in both height and angle. Includes a carry bag and 1 year warranty. This lightweight chair is a breeze to carry. With a fully adjustable face crest, chest pad, seat pad and armrest, this new massage chair offers excellent value for money and even comes with a free carry bag! The Elite Massage Chair will bring style and practical comfort to your clinic or mobile massage business. Designed for the professional practitioner, this chair packs a clever set of features with fully adjustable seat, chest, headrest and armrest supports, supplying total comfort for each individual client and therapist. Firm-n-Fold's robust designed massage chairs will compliment and enhance any therapist’s work environment. Like all Firm-n-Fold Equipment, these massage chairs are designed with quality in mind. 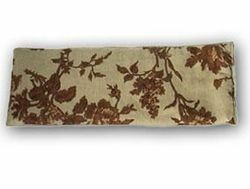 Includes sternum bolster and carry bag.